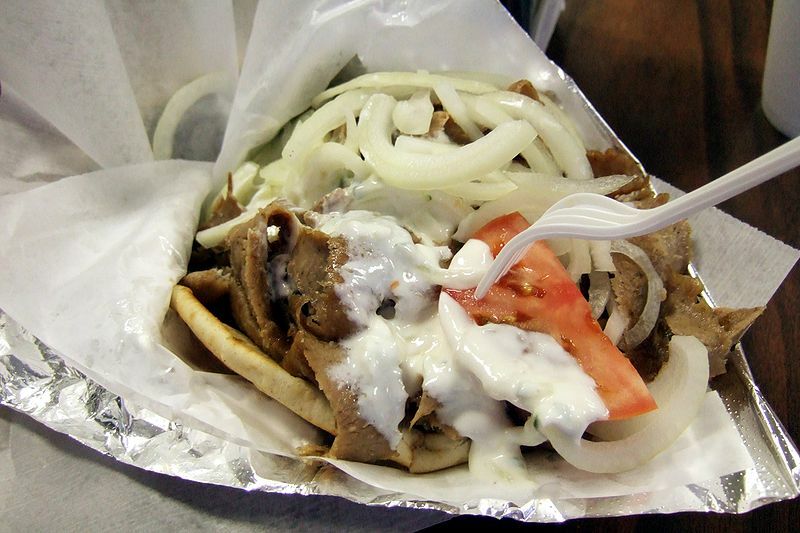 Gyros or gyro is a Greek dish, consisting of meat, tomato, onion, and tzatziki sauce, and is served with pita bread. Gyros may also refer to the sandwich, which consists of the same ingredients. Left: Gyro sandwich with meat, onions, tomato, and tzatziki sauce in a pita. The name comes from Greek γύρος ("turn"), a calque of the Turkish name döner kebab ("turning roast"). The Middle Eastern shawarma and Mexican tacos al pastor are similar to gyros, and all derived from the Turkish döner kebab which was invented in Bursa in the 19th century. 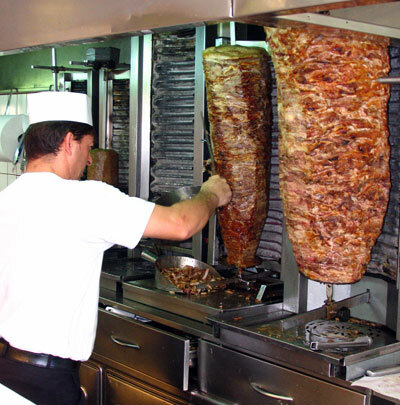 To make gyros, slices of meat are placed on a tall vertical spit, which turns in front of a source of heat, usually an electric broiler. If the meat is not fatty enough, strips of fat are added so that the roasting meat remains always moist and crispy at the same time. The rate of roasting can be adjusted by varying the strength of the heat and the distance between the heat and the meat, allowing the cook to adjust to varying rates of consumption. The outside of the meat is sliced vertically in thin, crispy shavings when done. It is generally served in an oiled, lightly grilled piece of pita, rolled up with various salads and sauces. The pita and gyro themselves are the only obligate ingredients; the remaining condiments to be added always being at the discretion of the customer, even down to the amount of salt and pepper used. Gyros served in the United States usually use a ground processed meat, pressed into large cones for cooking. Ground processed meat was also used in Greece until the 70s, but it was banned after several cases of food poisoning attributed to substandard storage. After a period of total ban, gyros was reallowed in Greece, albeit only in the form of raw meat sliced in thin strips.